A CROWD OF SCEPTICAL GRUMPS EYEBALL THE SUBJECT waiting for the facade to fracture. After participating in a number of experimental tasks, the subject should now be under the impression they are invisible. Aforementioned grumps scowl incredulously, trying to unnerve the subject, testing just how invisible the subject truly feels. The experiment appears to work, the anxiety dwindles quickly, and finally vanishes. The subject feels invisible. The cloak of invisibility withstood the barrage of grimacing glares. Thanks to some intriguing new research from researchers at the Department of Neuroscience – Karolinska Institutet, we could be a step closer to keeping that trendy cloak from exposing our socially delicate dispositions. We are all in our own way consumed by trepidation and anxiety when it comes to social experiences. Making a speech to your peers, or walking into a party, most people suffer a little from that silent, gnawing fear. 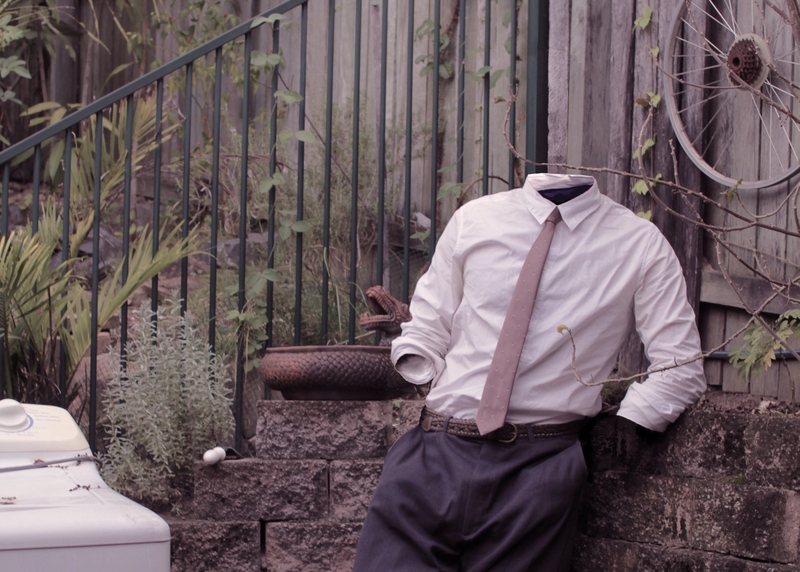 So, it is no surprise that our fascination with invisibility is such a cultural phenomenon. “Would you rather be invisible or have the ability to fly?” That old chestnut, eh? It is a bit of an obsession of ours, turning up in fiction as far back as Plato’s description of the Ring of Gyges. Fairy tales such as The Twelve Dancing Princesses mentions it. Just think of Harry Potter slinking through the halls of Hogwarts under his invisibility cloak. Or The Invisible Man from the 1930’s and 50’s. It is all there, we can’t get enough of it. ITV’s The Invisible Man (1958). So it comes as no surprise that researchers have begun using the illusion of invisibility as a way of testing its effectiveness in helping anxiety. Arvid Guterstam and colleagues at the Neuroscience department of the Karolinska Institutet in Sweden have recently conducted a series of experiments with the aim of “cloaking” its subjects using camera angle trickery, head-mounted devices, knives, paint brushes, grumpy-looking crowd members, and a solitary subject. In a previous study, Gutersam and his colleagues showed it was possible for people to believe they had an invisible hand. Participants placed their right hand behind a divider placed on the table. The experimenter then stroked the hand with a brush while simultaneously stroking the empty space visible to the subject. Fascinatingly, participants often felt their hand was in the empty space, rather than behind the divider. 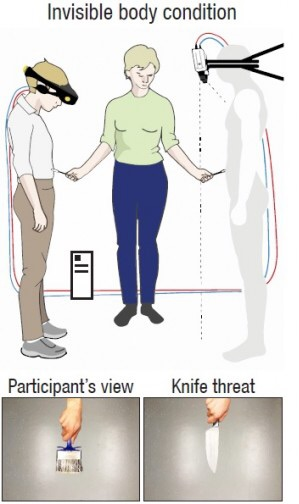 Following this experiment, researchers “threatened” the empty space in front of the subject with a knife. Many subjects felt threatened by the knife’s presence, and some exhibited physiological responses of fear (such as sweating). Subjects were so convinced their right hand was placed in the empty space in front of them that physical senses of touch, and even a physiological response of threat were present. In the most recent experiments, Gutersam and colleagues aimed to provide an experimental model of what it feels like to be invisible. The experiments were aimed at understanding the effects of feeling invisible on bodily self-perception and social cognition. For the eight different experiments, the researchers recruited 125 volunteers. The volunteers were equipped with head-mounted displays that provided real-time video from two separate cameras set up in the corner of the room at the participants’ head level. The cameras were facing the floor so that when the participants looked down, their bodies would appear as a void, empty space. Similar to the invisible hand experiment, the researchers used a paintbrush to stroke different parts of each participant’s body, only this time, researchers simultaneously moved another paintbrush in the corresponding part of the camera’s view. The brush was applied to the stomach, the lower arms, the lower legs and the feet. They hoped that by doing this, the participant would be under the illusion the brush was stroking an invisible body. Next, the experimenters tinkered with the synchronicity of seen touch and felt touch. To do this, they tested participants under one of three synchrony conditions (synchronous – seen touch and felt touch at the same time; asynchronous – seen touch and felt touch out of sync; spatially incongruent – in sync, but brush strokes were delivered to different parts of the body). As hypothesised, spatially matching and synchronous strokes produced a stronger feeling of ownership to the invisible body than the asynchronous and spatially incongruent strokes. The researchers then pretended to threaten the invisible body with a knife, and measured the physiological response of each participant, such as skin conductance i.e. sweating. Researchers reported that subjects sweated more when they strongly identified with the invisible body. The participants were also required to complete questionnaires, which examined how much the subject believed the invisible body to be their own. To measure the how the subjects coped in a social situation following their donning of the invisibility cloak, the researchers placed the participants in front of an audience of “serious-looking strangers”. This situation was created to mimic a stressful social situation. Researchers hypothesised that, if people were to see their own bodies as invisible, they might think they were invisible to others, too. Again, Gutersam and colleagues measured the physiological responses of participants and asked them to rate their stress levels. They discovered that when the participants perceived themselves to be invisible, their heart rates were lower and they reported feeling less anxious. Gutersam and colleagues stated they hope to one day successfully cloak macroscopic objects, like a limb or entire body. An interesting and exciting prospect on paper, but does this rely on an entire population “cloaking” themselves using special technological deception? The trickery of camera angles and head-mounted devices may indeed swindle the brain into believing its body is invisible, but the whole process relies on the subject accepting the ruse as true; the confidence of its success lies in the subject not being aware of the fact they can indeed be seen. I feel the results found from this research could provide solutions to a number of issues, such as social anxiety, but it needs more time. Obviously, it is unrealistic to expect a creation that physically cloaks a subject to the point they become invisible, so for now we must accept the closest thing to it. I am in motorways and factories and birthday parties. Vapid and baseless, there is some kind of mystery to me, magnetising a mythical but ostensibly unattainable wish. As my anxiety grows I understand I need not fear this unpleasant existence. In a virtual room; invisible to my peers as I prowl the room. A knife at my gut or brush on my arm, it does not change a thing. I feel pleased with myself; cloaked and imperceptible, shrouded in 0’s and 1’s. The dread and trepidation has now subsided. I lurk around you silently, faded in the lampshade. The invisible man. I’m invisible, man. Hey, check out this two part profile of Homer Simpson. Skynet is coming for us all, Billy writes.